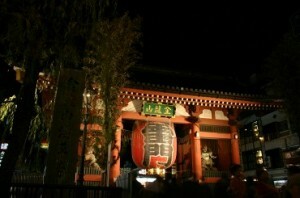 Asakusa is a part of Taito-ku, Tokyo, and it’s one of the major Japanese tourist sites for foreigners. Everyday, tourists crowd into the Sensoji Temple, which was founded in 628. 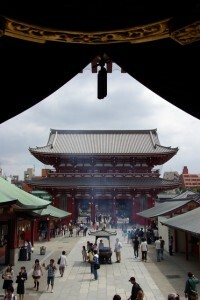 It’s the oldest temple in Tokyo. 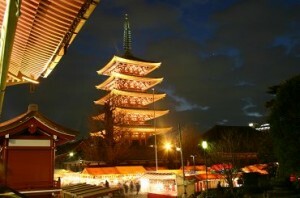 In addition to the major temple, there are the Five Storied Pagoda, the Nakamise shopping arcade, and Asakusa Shrine in the Sensoji Temple site. The famous main gate is called “Kaminarimon”, which has a huge chouchin (paper lantern) and the God of the Wind on the right, and the God of Thunder on the left. Where is the Safest Area to Live in 23 Wards of Tokyo? TSUKIMI — The Japanese Moon Appreciating Day!